Did you know that we can make your product in a government inspected kitchen to your unique specifications including packaging and labelling? Click here for more details. If you have work, we have workers. Our Supported Employment model will save you time and money on recruitment, training and retention. Click here to find out more. 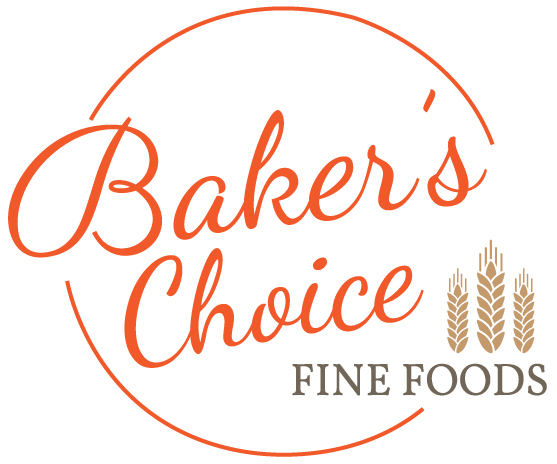 Check out our home-style, made fresh products. Call 902-681-6766 to place an order. Providing valuable and meaningful work and training opportunities since 1970. Thank you for being part of our continued evolution as a leading Kings County service provider. The Flower Cart Group believes that everyone has the right to meaningful, challenging employment. We provide vocational service to adults considered to have an intellectual disability who reside in Kings County, Nova Scotia, Canada. 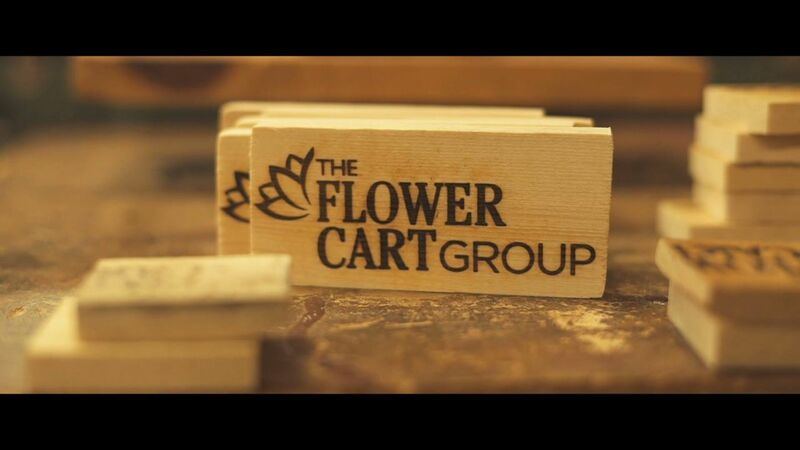 The Flower Cart Group is a conglomeration of social enterprises serving a dual purpose – working to provide employment training opportunities that enrich the lives of participants, and adding value for Valley businesses. Click here to view or download our 2018-21 Strategic Plan. Click here to download our April 2019 Newsletter. Current opportunities include a Summer Student and a volunteer position. Click here for more details. 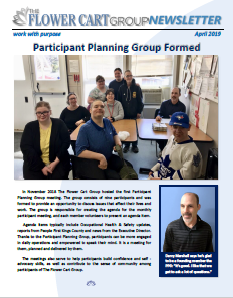 Our April 2019 edition of The Flower Cart Group Newsletter is now live. To view or download any of our newsletters, click here. 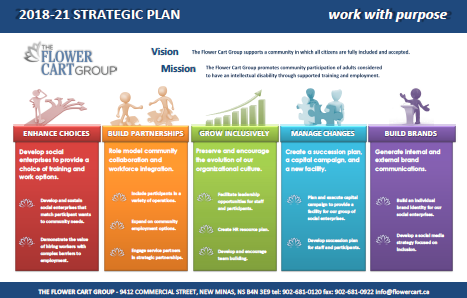 Click here to view The Flower Cart Group's 2018-21 Strategic Plan. Inside you'll find a clear, ambitious map for an exciting road ahead. Thank you for visiting The Flower Cart Group’s website. We value privacy and are committed to protecting the privacy of personal information in accordance with our confidentiality policy, applicable information protection legislation, and public expectations for confidentiality. For more information please contact the Executive Director at 902-681-4541.